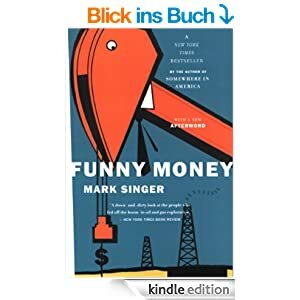 “Funny Money” is a rather “old” book, originally from 1984, covering the story of the Oklahoma Oil boom in the early 80ties and the subsequent bakruptcy of Penn Square Bank. The most interesting thing about the book is that nothing is ever new in finance and history always repeats although not exactly but in similar fashion. Penn Square Bank was a small Bank in Oklahoma City which was lending to local Oil and Gas companies. When a big well was found (the “Tomcat”), prices in that area exploded and a great boom started. Very similar to the real estate boom many years later, Penn Square was lending against market values, which in boom times looks always good. Penn Square could do even more harm via “syndication”, in many cases they did pocket the arrangers fee but only kept 1% of the loan and “upstreamed” the other 99% to bigger banks. One of those banks, Continental Illinois, one of the largest commercial lenders in the US at that time went under 1 or 2 years after Penn Square and had to be bailed out by the US Government. Although the instrument is different, this is exactly what happened with all the CDO structures 25 years later in our socalled “Financial crisis”. The book also offers a lot of insight into the Oil and Gas explorer industry which I think is still relevant today. MLPs for instance were very popular already back then, but as always, mostly only some of the promoters became rich. Funnily, one of the most notourious promoters at that time, Robert A. Hefner IV, seems to be still around. The author originally covered the events as a reporter for the “New Yorker” and then packaged the stories into a book. So its a pretty good “real time” description of a classic boom & bust cycle fulled by credit and credit derivatives. It is also proof that you don’t need to combine investment banks and commercial banks to screw up, commercial banks can do that on their own pretty well. Interestingly in the book, one senator gets quoted that “bank deregulation had gone too far” back then in the early 80ties. But this was a time what we would consider now as “tightly regulated”. Another similarity to modern cases is the fact, that none of the “big guys” had to go to prison, only “lower level” guys got sentenced and one of them only because his employer needed to cash in the fraud insurance policy. Finally, the main players of the Oil Boom behaved very similar to Investment bankers in the 2000s and Internet entrepreneurs today. Private planes, helicopters, 1000 USD dinners etc. were already standard for the high rollers back then. I think the main take-away from the book is that boom and busts will always occur and banks are inherently instable especially when there is a lot of credit growth. As an investor, it usually pays to stay out of such areas, unless you are very close to the promoters, otherwise the risk to get “fleeced” is very high. Summary: I can highly recommend the book to anyone who is interested in the history of capital markets, especially boom and bust stories. This is one of the “classics”. As an add-on it gives some insight into the Oil and Gas explorer/drilling industry. I think it is cheap due to exposure to Ukraine and Russia and the low free float of just ~35%. I took a dive into fracking which is a quite different business from conventional oil/gas. I could not proof or disproof if fracking is a business to invest in or not. My main contra argument is, that the continuous well drilling requires constant capital investments – conventional does not. at first the easy spots are exploited, than the harder spots are drilled. I compared wells against each other, some wells produce gas at a constant rate, but most rates are decreasing by 5 – 50% per year (geometrically). Drilling costs are not published (anymore) by EIA but some productivity data is published by companies. The man hour can be used to approximate the drilling costs per well. Whats really ugly about Fracking is that the numbers found in newspapers and said by politicians are mostly false – on the pro and contra fracking side! For example they multiply the size of fracking gas field by the recovery rate of conventional gas (as Obama did). What you get is a large number of which only a fraction can be pulled out of earth. Looking into the future, Europe will be a very interesting fracking opportunity! All gas pipeline infrastructure already exists and may parts of the economy uses gas to fuel their machinery. This makes selling the fracked gas easy. In the US it is much harder as the infrastructure has to be build and the economy has to switch from oil to gas. The whole eastern Mediterranean sea is a gas rich region. Proofed are Greece, Cyprus, Turkey, Syria, Israel. Egypt might have gas fields. Only after the development of deep sea drilling + fracking these resources became available. Not very surprising, that most of these countries are in a crisis, as external forces try to gain control onto these resources. Looking forward to see interesting energy sector companies! i laughed out loud at this. the funny thing is that he has probably made a fortune for himself.